A remote village hall was among the first recipients of a grant awarded from the newly managed William Milburn Charitable Trust Community First Fund. Walton Village Hall was recently fitted with four new laptops and a printer, along with broadband connection that was all free for public use. 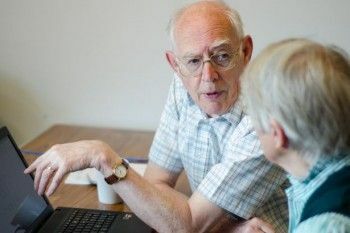 However, many older people within the parish did not use computers or the internet, which prompted volunteers to provide the training. Volunteers used a grant of £500 from the Trust to run two computer courses in the hall. The classes were aimed at beginners and those with a little more experience and covered basic word processing, accessing the internet and staying safe online. Both courses ran over a five week period and were led by a tutor from Carlisle United’s Computer Suite. Walton is a rural parish. Located three miles from the nearest shops, cafes and learning centres in Brampton, there are only two public buses running each week which makes it difficult for people in the parish to get to Brampton or Carlisle if they cannot drive. As a result of attending the classes, the course leader noticed that service users had grown in confidence when using a computer and they could now use the internet to help them in their everyday lives. Emma said: “One lady had not used a computer much before attending the course. She has learned to use the internet and feels this has made a significant difference to her life. She now uses internet banking as the local branch of her bank had closed. She can also order her shopping online, saving her the time and expense of travelling to Carlisle and back. The classes were such a success that volunteers are now planning on running another course during the summer.